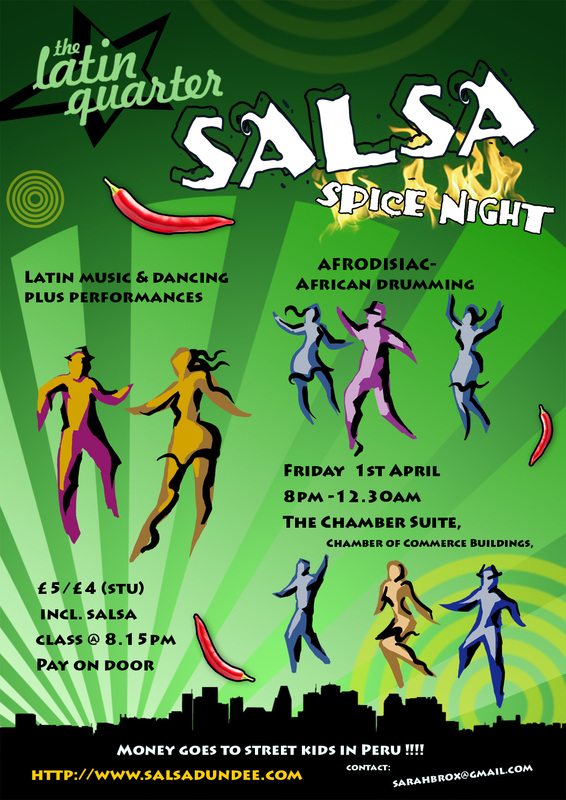 Latin Quarter Spice night on Fri 1st April, 8pm till 12.30am at The Chamber Suite, Panmure St, Dundee DD1 1ED a night of latin dancing ( much like a normal Latin Quarter night but with the added SPICE of performances from the Spice countries). So far we have the brilliant AFRODISIAC and others TBC. The AFRODISIAC group are from all over Angus and have been together for over 10 years, they play West African rhythms, including the occasional bit of singing and dancing too. There’s a free salsa class at 8.15pm and a raffle too. Tickets on the door, £5/ £4 ( stu). Money raised goes to the Azul Wasi project in Peru for Street children. Email sarahbrox@gmail.com for more details. Why not come along, have fun, spice up your life & help children at the same time ! Will send more details about performances once confirmed. Please print off if you can & pop one up.